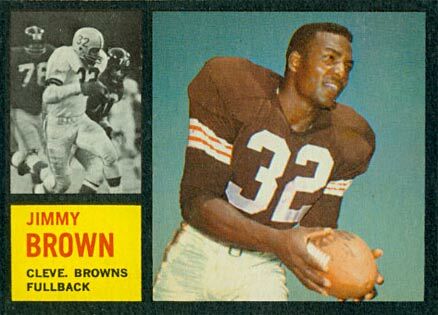 Jim Brown football cards are high on many football card collectors’ lists. Especially his 1958 Topps rookie card. In college, he played fullback for Syracuse University before being drafted in 1957 by the Cleveland Browns as the sixth pick in the first round. He played for the Browns from 1957 through 1965 leading the team to a championship in 1964. This guide takes a detailed look at not only the most valuable Jim Brown cards but some of his lesser-known issues as well. The 1958 Topps #62 Jim Brown rookie card is one of the most iconic and valuable football cards in the hobby. During his first season he was named both Rookie of the Year and Most Valuable Player. The card features a young Brown in his #32 jersey making a sharp cutback. Unfortunately, this card is troubled by print defects, poor centering and chipping on the reverse red edges. It's still a sweet card and easily his most important. Not to mention it's one of the most valuable football cards in the hobby. His 1959 Topps card shows Brown from the waist up, holding a football in one hand with a determined look across his face. The printing quality does not tend to hold up in the long term but can be preserved if cared for properly. The blue background highlights Brown’s intimidating features and size, matching the blue and red lettering below his picture. In 1960, Jim Brown had already cemented his reputation as a fearsome and intimidating fullback. His 1960 Topps card is somewhat plain in design. A headshot of Brown takes center stage while in the bottom right hand corner is a blue football with his name, team and position. Those somewhat dull features of the card do make it easier to find in high grade, though, as there are not as many print defects as you'll find on Brown's other cards. Fleer created their own Jim Brown card in 1961 competing directly with Topps. It's the only vintage Brown card that the company produced, however. In it, he is wearing the white uniform which largely takes over the card. In the right hand corner is the Brown’s mascot in orange, brown, and white. Because of the large amount of white on the card, it can be prone to discoloration over time. 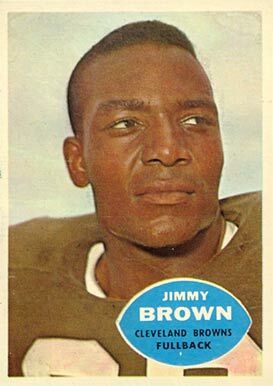 Topps released two cards for Jim Brown in 1961, one of which, #71, follows the typical Topps formatting and design. The other card, #77, is a “1960 Football Highlights”, and is designed to look like a TV, with Brown running with the ball. It’s more of a live action card. #71, on the other hand, shows Brown with the ball in motion looking to run for a touchdown. At the bottom of the card his name, position, and team is listed. The bright blue background behind Brown serves as a stark contrast to his dark brown jersey. The card has a lot of pop to it and looks great but it is not one of his most valuable. In 1962, Topps came out with a landscape design with black border segmentation that divided the cards into three sections. The majority of Brown's card is taken up by a picture of him cropped from his 1961 Topps card on the right side. On the bottom left corner, a bright yellow box shows his name, team, and position. Above the box is a black and white action shot of Brown blasting down the field during a game. It's one of his most valuable cards but can be tough to find in high grade due to the black borders being susceptible to showing chipping and wear. The 1963 Topps card took a slightly different aesthetic design, with a close up of Brown’s face surrounded by a light green and darker green border. Some collectors think the green border design is odd. But I think it adds an extra layer of design appeal and highlights Brown’s face in the card. Those same green colored borders can show wear and chipping easily, though, so be careful. Centering can also be a tough challenge with this card. In 1964 the Philadelphia Gum Company created their first NFL product and Jim Brown was a featured part of this set. Brown is kneeling down with his helmet in the crook of his arm. It's one of my favorite Jim Brown cards just because of the cars and parking lot in the background. Just seems odd and funny to me. The card boasts great imagery and coloration overall and is a key to the set. 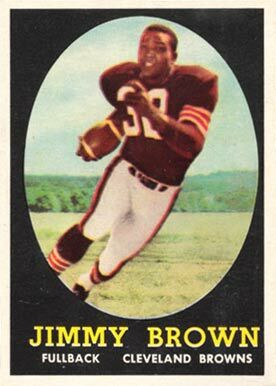 The 1965 Philadelphia Jim Brown card takes a much different design and aesthetic stance than the 1964 set, looking more like a Topps card. This card focuses on Brown’s face, as he looks straight ahead. The text box featuring his name, position, and team is black with white writing. Next to the text box is the NFL logo, and white trim around the entirety of the card. This card is highly valued by collectors, because Brown retired after the 1965 season, making this his last card produced while he was still an active player. 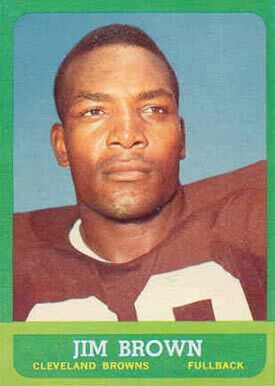 Jim Brown's last card was the 1966 Philadelphia issue. The imagery really helps this card stand out as we get a nice close-up of Brown on a bright day. His 1964 Philadelphia card is probably the most popular of the Philadelphia issues but this is still a fantastic card. What makes Brown truly impressive is that he was a natural athlete, lettering in three different sports besides football at his time at Syracuse University. He was one of the nation’s best lacrosse players in his high school and college careers. Brown was drafted by the Cleveland Browns in the first round, and was the sixth pick overall. As a fullback, he led the league in rushing touchdowns, rushing yards, average yards per game, and offensive touchdowns in his first season. This earned him Rookie of the Year as well as the Most Valuable Player in his first season. He was a three-time MVP winning the award in 1958, 1963, and 1965. He was selected to the Pro Bowl in each of his nine seasons and was an NFL All-Pro First Teamer eight times, missing out in 1962. 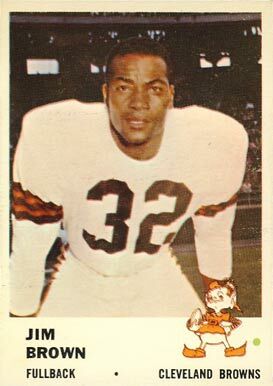 During his impressive 9 year career, Brown played exclusively for the Cleveland Browns and led them to a championship in 1964. Brown was inducted into the Pro Football Hall of Fame in 1971, and the College Football Hall of Fame in 1995. After his football career, he enjoyed an acting career, starring in movies and TV shows from 1964 to the present.